worked in television production in the late 70's and early 80's after leaving his native Ohio. In 1982, he moved onto post-production and later co-founded VDI MEDIA, a Los Angeles based television post production and duplication facility (now traded on NASDAQ as VDIM). Some of VDI's Clients include Warner Bros., Universal, Disney, Fox, Turner, and Sony as well as nearly 2000 other clients. VDI performs digital film mastering, conversions, closed captioning, digital duplication, and dubbing. Prior to VDI, beginning in 1981, he was Vice President of AME, a Burbank based post production facility. In April 1987, AME went public, Mr Bajorek served on the Board of Directors until September 1989, when the company was purchased and taken private. He left in 1990. Currently, Bob founded and is president of a new production company, Blue Marlin Productions, an independent film and television production company. Blue Marlin's current project are "SEA DEVILS", an action-comedy feature, "THE FLAG", a TNT original, "GOODY GEAR, a half hour comedy pilot beginning in the fall and "TEST PILOT" a documentary for the Discovery Channel . was born in Maryland and raised in Calcutta, India. His overriding passion for American cinema led him to Los Angeles in 1986. After completing the graduate program in cinematography at THE AMERICAN FILM INSTITUTE, Amit honed his craft on countless shorts, music videos and a stint at Roger Corman's Concorde Pictures. Amit's credits include 5 feature films and commercials for such clients as Mercedes Benz and LA MTA. is a graduate of Film Studies at Rocky Mountain College. He was mentored into the Studio realm by Mel Gibson and began working at Warner Bros. in 1996 in the Corporate Feature Department as a post production executive for over 40 films. Prior to Warner Bros., Mr. Hogan was under contract with Big Sky Video Productions as producer of numerous projects direct to video. In 1992, Mr. Hogan won an emmy for his creative participation in the ABC mini-series "SON OF THE MORNING STAR". Mr. Hogan is Chief Operating Officer and producer for Blue Marlin Productions. He is currently working on his next feature film "SEA DEVILS" scheduled to begin shooting in the Winter of 2001 as well as 4 other films and TV projects currently in development. is not ashamed to admit that he is an LA native. After beginning his career as a intern for Ixtlan, Oliver Stone's company, and subsequently putting in too many hours working production jobs for various film and television projects, including "WILD PALMS" and "PLAYING GOD", he turned all his efforts to writing. After selling a story to the television series "LOIS AND CLARK: THE ADVENTURES OF SUPERMAN", "BORDER TO BORDER" followed, his first produced feature. Subsequently , he has done a rewrite on the just-produced feature "BEYOND THE CITY LIMITS", with Natassja Kinski, and "THE VAULT" is set to go before the cameras in March 2000.
is a graduate of Bartmore Beauty College and has a Cosmetology license in California. Even though she was born and raised in California, she has traveled throughout the world as a top stylist. At Marshall Imports, she not only was a top stylist but an instructor as well and staged numerous hair shows. Her other film credits include "RED THREAD" and "BEYOND THIS POINT" and thrives on the extreme challenge and the high demands of styling hair for entertainers. was born and raised in Southern California and has worked for 23 years in the engineering side of teleproduction community. As Director of Engineering for Warner Bros. Video Operations, he is responsible for the developmental implementation of new technology for feature film mastering. As a movie producer, Chris Dane Owens' debut film "Border to Border" (distributed by Independent Artists) has won many recent awards, including "Best Picture" at the Las Vegas International Film Festival. It was also awarded "Best Comedy" and "Best Actress" (Colette O'Connell) at the New York International Film Festival. The film stars O'Connell ("13 Days," with Kevin Costner) and features Jonathan Silverman ("Weekend at Bernie's"), Rue McClanahan ("The Golden Girls"), Abe Benrubi ("ER," "Twister"), Curtis Armstrong ("Risky Business," "Revenge of the Nerds") and Chris Owens' father, Gary Owens ("Laugh-In," "The Gong Show", "European Vacation"). The movie, which was shot in over 140 locations in two countries, is described by "Entertainment Tonight" film reviewer Leonard Maltin as "No small accomplishment! A solid script ... very well directed. A very likeable movie." In October, 2000 Owens sold his co-authored script "Gabriel's Gift" to producer/director Robert Marcarelli ("The Omega Code," starring Casper Van Dien and Michael York). The screenplay, best described as a "romantic comedy with spirit," is scheduled to shoot in October, 2001. The project will be co-produced by Owens and Marcarelli. Owens and creative partner Jerry Biederman are developing numerous Reality TV series. At present, their company (Biederman/Owens Entertainment) has seven series in development with Lions Gate, Cosgrove/Meurer, lmno Productions, and King World. Owens was also a co-producer on the highly successful home video "Sing Like the Stars" (distributed by Parade and Blockbuster Video). The project was nominated for "Best Instructional Video" at the A.V.A. Awards (sponsored by Billboard magazine). The program features many star appearances, including Bobby Brown, Chicago, Wilson Phillips, John Stamos, Nelson and Def Leopard. While studying cinema at both UCLA and AFI extension, Owens produced his first short film, titled "Rapscallion." This sci-fi action/comedy co-starred Jonathan Winters as a "psychic visionary from another dimension." Owens was a contributing author on the books Earth Angels (Broadway Books, a division of Random House) and 101 Ways to See the Light (St. Martin's Press). Both books were co-authored by best-selling author Jerry Biederman. Owens projects have been featured on "Entertainment Tonight," The E! Channel, KTLA's "Morning Show," and written about in the Los Angeles Times, The New York Times, the Los Angeles Daily News, Beverly Hills 213 magazine, Daily Variety, Hollywood Reporter and Billboard magazine. grew up in Sacramento, CA. Before embarking on her entertainment career, Karen played professional soccer in Japan for two years. She moved to Los Angeles in 1996 and worked at both Warner Bros. and 20th Century Fox on such shows as "LOIS AND CLARK: THE ADVENTURES OF SUPERMAN", 413 HOPE STREET & VENGEANCE UNLIMITED. She is currently working on the hit show "MALCOLM IN THE MIDDLE"
THE SWEDISH PRINCESS is the current film project and feature length directorial debut for Jason Schulz. The film, which was co-written by Schulz, has received considerable attention and was recently featured in numerous print publications within Scandinavia, as well as the national TV 4 news, several late night Swedish comedy shows and the topic of several interviews on Radio Sweden's Sounds Nordic show. The film is to be shot in Chicago and Stockholm the summer of 2002. Schulz has been involved with various other TV and feature projects. Most recently, Schulz produced and directed a corporate presentation for Warner Bros. featuring Drew Carey of the Drew Carey Show. Schulz was Casting Associate on the feature film Border To Border (distributed by Independent Artists) and the TV pilot There's Something About Marriage, Co-Produced the short film Verge (AFI) and was Associate Editor on the short film Rapscallion co-starring Jonathan Winters. Additionally, Schulz is author of Everything you Need to Know As a Motion Picture Extra (Stoneybrook Family Publishing) and a contributing author for the book 101 Ways to See The Light (St. Martin's Press). Armed with an 8mm camera by age 8, Thomas Whelan began his career in film in Sacramento, California. After graduating from Vancouver Film School in 1993, he moved to Los Angeles to pursue the virtues of the Independent Film circuit. Surviving the grueling 18 to 24 hour work days required by the Independent filmmaking process, he eventually started working for Warner Brothers Television on the hit show, "Lois and Clark." Whelan quickly realized the vast differences of the processes of the Studio verses low budget filmmaking, and dually became convinced that cohesion of these two styles would have a mutual benefit, dubbing it "Gonzo filmmaking." Seattle, Washington to Mexico without ever obtaining film permits. 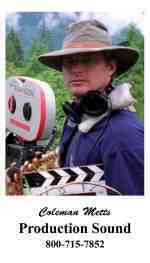 Whelan wrote, produced, and directed "Border To Border" which went on to win best picture at the New York Independent Film Festival, the Las Vegas Film Festival, and the Napa Valley Film Festival. "Border" later went on to get distribution from Independent Artists in Los Angeles. Whelan’s current feature film, "Sea Devils" is scheduled to start shooting in March of 2002, and is a narrative surrounding Italian Frogmen during World War II. Locations for this film are slated to shoot in Italy, Malta, and Australia; www.filmforce.ign.com currently displays behind-the –scenes footage in "the making" of this film. At present, Whelan is in his third season with the Fox’s hit television show, "Malcolm in the Middle" which has been nominated for eight Emmys, including Best Comedy Series. Born in Los Angeles, Caroline graduated UCLA with a B.A. in Communication Studies. Her first post-college job was as a writer's assistant on the television show "BAYWATCH". This was followed by a stint as a production assistant on the first two seasons of the television drama "ER" and another year as a writer's assistant on the sitcom "CHICAGO SONS", both at Warner Bros., where she met many of the producers on "BORDER TO BORDER". During her free time, she began script supervising on independent shorts and features, eventually switching over to indies full time, including "BORDER TO BORDER", "SCREENLAND DRIVE", "BOB'S VIDEO", and "A MAN IS MOSTLY WATER". She received an associate producer credit on "BOB'S VIDEO" and has since been producing shorts, including "WHEN WE CAN FLY", "SHANGRI-LA CAFÉ" (directed by Lily Mariye who plays nurse Lily Jarvik on "ER"), "GAME DAY" (a USC graduate student film shot on HD), and "FUGLY".